Let's talk about SAM flags. We'll breeze over some background (skipping details better left to CS majors), filter alignment records via their flag bits using Samtools, and end with how to create a valid BAM containing read pairs or sets where at least one record has the specified flag bit. 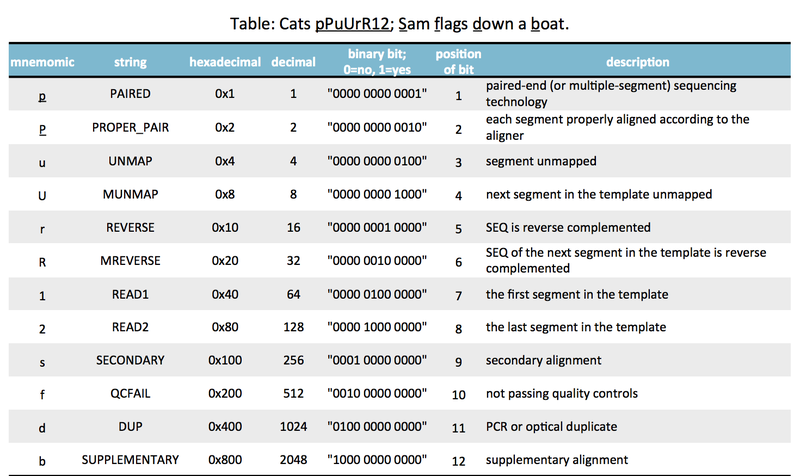 SAM flags summarize many properties of reads, represented by flag bits, into a single number. Think of each flag bit as one layer of watercolor paint on a canvas. Each SAM flag is then the distinct chroma resulting from multiple layers of overlapping pigment. That's the mnemonic I created to memorize the twelve characters in pPuUrR12sfdb. 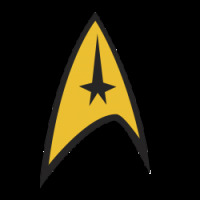 Typically, I use the Explain flags page on the Picard website to decipher SAM flag values. To do better, I made a summary chart and mnemonic for the twelve SAM flag bits. The chart's rows 1–8 refer to cats purring (pur1 and PUR2), and rows 9–12 refer to the title of this blogpost sfdb. If you are an American football fan and/or watched the Super Bowl last week, you may know the Carolina Panthers' mascot Sir Purr. Sir Purr's team lost 24:10 and gives us another mnemonic: Sir pPuUrR12 loses Superbowl Fifty to Denver Broncos. If you're interested, this exercise uses Mac OS's Calculator app. Switch to Calculator's Programmer mode and play around with the features (A–E) I've highlighted in the figure. 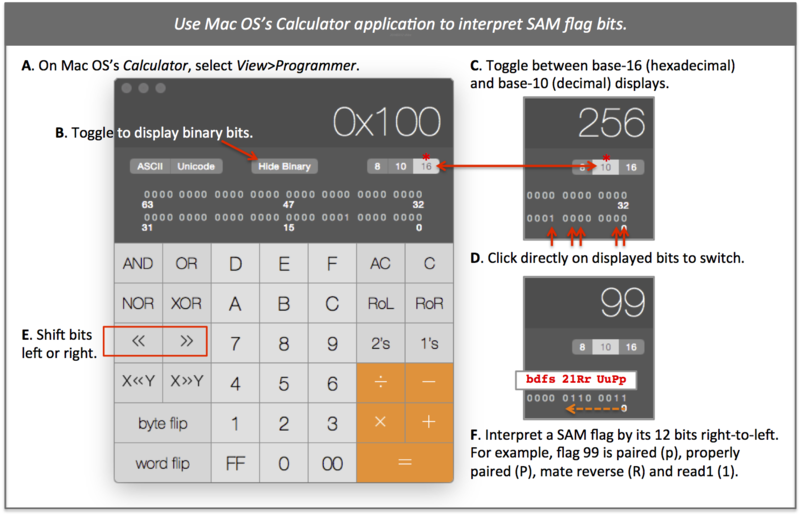 In the example in (F), SAM flag 99 displays in binary as 0000 0110 0011. This is read right-to-left, where 0=no and 1=yes, giving us yes values for positions 1, 2, 6 and 7. Using our mnemonic, this translates to pPR1 or paired, properly paired, mate reverse and read1. If you forget what a particular bit represents, use the samtools flags command as shown below. Replacing 256 with SECONDARY or 0x100 returns the same answer. The flagstat option gives a useful summary count for the SAM flag categories. The next set of commands either display actual records or return counts -c of records. Depending on capitalization, -f and -F either include or exclude records with the specified flag bits, respectively. Listing two flag values, e.g. -F 2 -f 256, returns records that satisfy both conditions, e.g. not proper pair and secondary. For transforming BAMs, I stick to using Picard tools for downstream GATK compatibility. At one point I wanted to visualize in isolation only secondary alignments but in the context of their read sets. To create such a subsetted BAM, I used three commands. The first uses the 256 SAM flag to extract the read names, the second sorts reads by queryname, and the third command uses FilterSamReads and the list of read names to generate a valid BAM containing our reads of interest. Since forward and reverse reads in a pair and multiple alignments for a given read are all identically named in the BAM, the list of read names pulls out the alignment set for a given read name. You can also set the FILTER parameter to excludeReadList. Nautical flags at top spell SAM FLAGS. If I've gone overboard with sailing references, je m'excuse. I've had a great year racing solings.